Zazzle Affiliation For Bloggers - Success! Zazzle is a fun, and for many, a profitable way to earn a part-time or better income adding art and designs to products for people to buy. But you don't need to make products to make money with Zazzle. In fact, those who refer or affiliate are by far the biggest money makers on Zazzle. Instead of creating their own products, they choose the best looking and best selling designs of others to promote in their blogs, on their web sites and throughout their social media. We've found Zazzle to be one of the best of all the affiliate programs we've worked with. 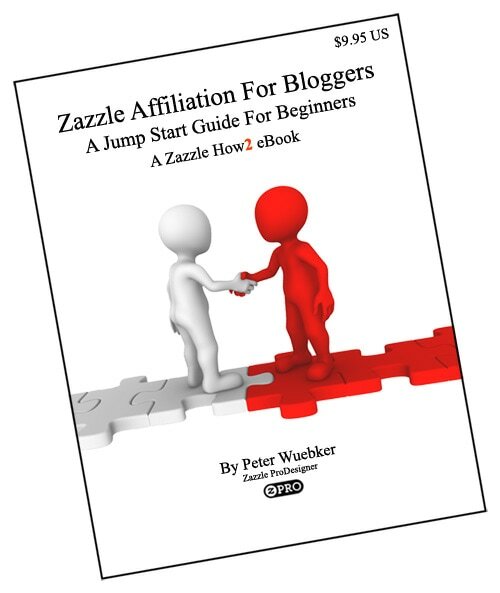 Written for those new to Zazzle or experienced Zazzlers who have never tried referring sales (Shame on you), Zazzle Affiliation For Bloggers will have you up and affiliating faster than it will take you to read this 50-page guide. You will learn how to track both your sales and clicks so you can improve your results. Included are tips for picking popular products and where to get started when you are ready to start adding links. ​Zazzle has designs and products to fit any blog theme; travel, food, fashion, weddings, politics, home decor and yes, even bacon bloggers will find products that are a good fit for their audience. II. Why Affiliate With Zazzle? Q: What do I get when I buy Zazzle Affiliation For Bloggers? A: You will receive an email with a link to download a 3.5 mb pdf. A: Just take a look in the sidebar to the left for several other eBooks and helpful tools to grow your business.